Applications and a complete job description are available at the City Office. Mon-Fri., 8:30 am- 4:30 pm. Contact Shannon Sommer, City Clerk, at (907) 383-2696 or by e-mail at sptcity@arctic.net. THE CITY OF SAND POINT IS A DRUG FREE WORK PLACE. APPLICANT MUST PASS MANDATORY DRUG SCREENING AT THE TIME OF EMPLOYMENT. 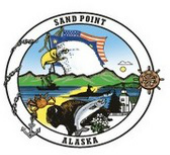 THE CITY OF SAND POINT IS AN EQUAL OPPORTUNITY EMPLOYER. WOMEN AND MINORITIES ARE ENCOURAGED TO APPLY.